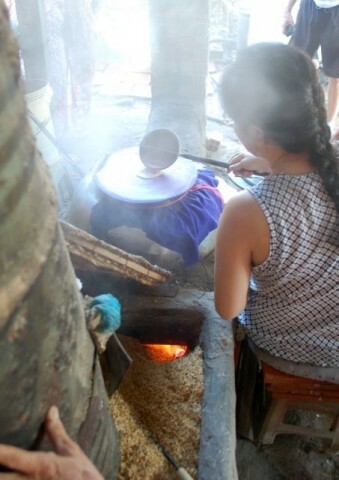 In the nearby town of Hoc Mon, Di Yen visits her favorite rice shop. 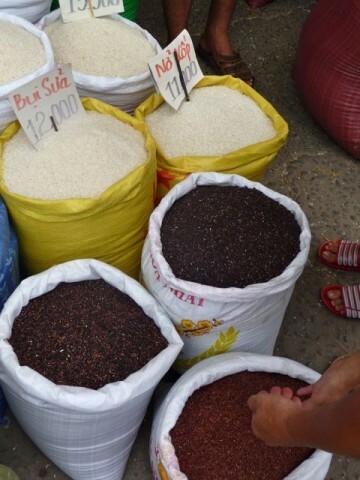 For our small batch, she purchases 10 kilos. I requested whole grain rice paper, so my aunt decided on red rice. It’s often labeled cargo rice in US, for the bulk shipping method used to transport it. 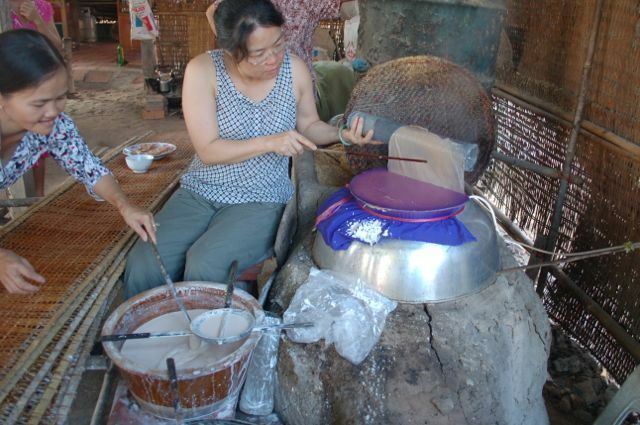 Having estimated the amount of water required by experience and feel, Dien now stirs the rice gently to ensure it feeds evenly into the stone wheels. 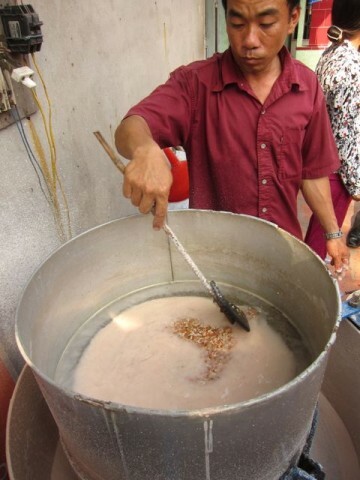 My aunt ended up also trying out a half polished, half whole-grain mix, so they decided to grind that batch first. 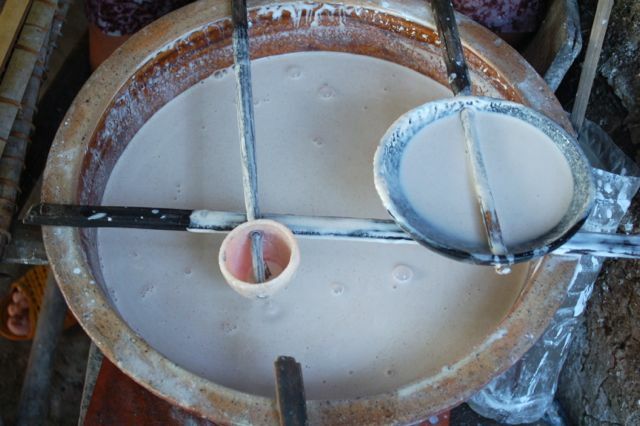 The ground rice batter sits for another day. Adding rain water helps achieve the right body and texture. Then, it’s just a matter of spreading it super thin over a piece of fabric, letting it steam for a few seconds, removing it intact with a wide roller, and then unrolling intact onto a bamboo mat. All the while, of course, keeping an eye on that fire that’s heating your stove. Simple! 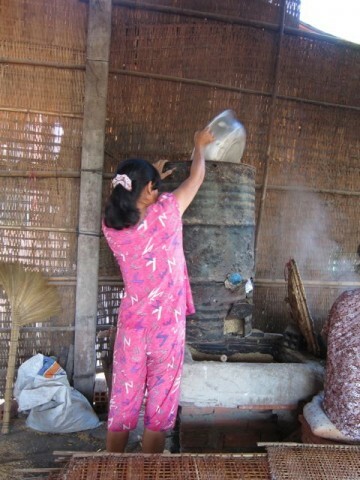 The stove is fueled by rice bran only. A thin poker helps push more as needed to keep an even flame. 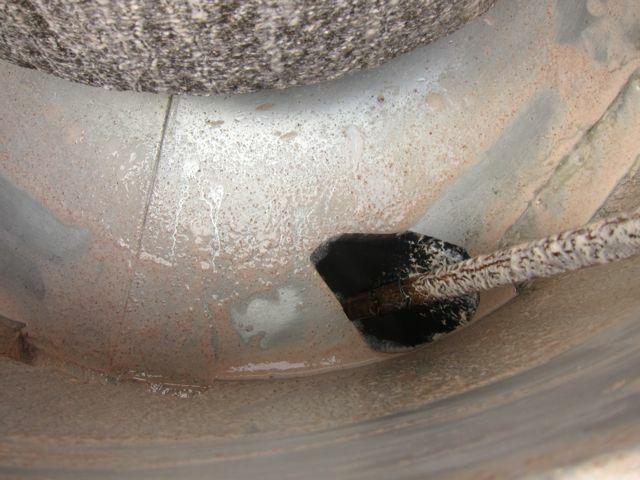 Adding rice bran to the stove’s hopper. 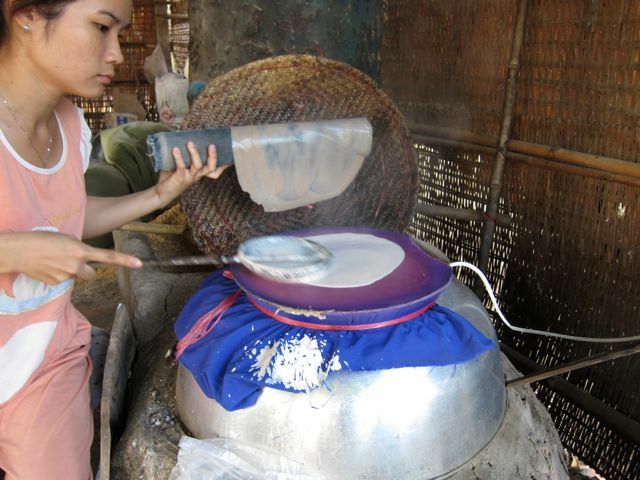 The ladle’s flat bottom side helps spread the rice batter thinly and evenly over the tautly stretched fabric. The timing is precisely calibrated with each shop’s unique set-up. 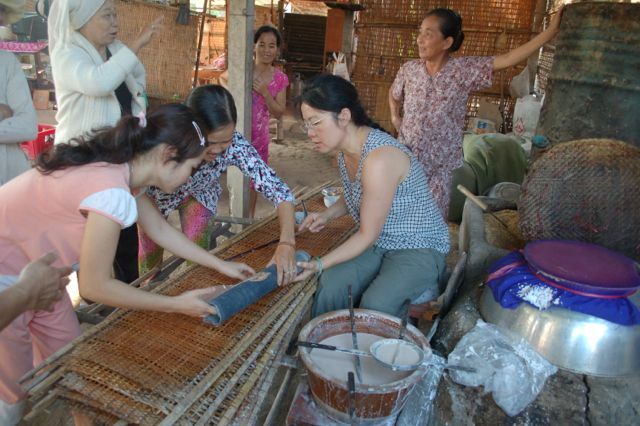 Here, Trinh holds aside the previous round; she’ll unroll it onto the drying mat right after covering the round she’s forming right now with the bamboo lid behind her. The little orange cup portions batter, one and a half scoops for this particular shop.The large ladle is already pre-filled with just enough batter. 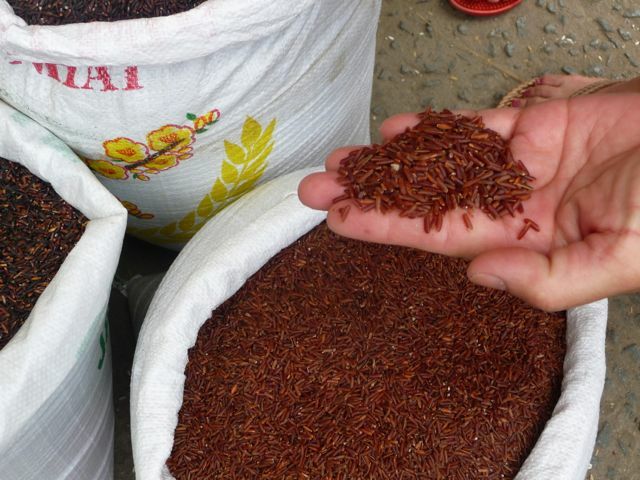 Even with its bran, the red rice creates translucent, paper-thin banh trang. 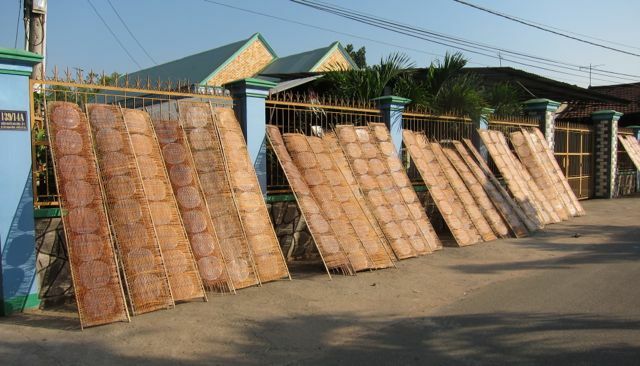 The neighbor across the street kindly lets us spread our rice paper across her sunny fence. After drying a little in full sun, the rounds are moved to a shaded area. 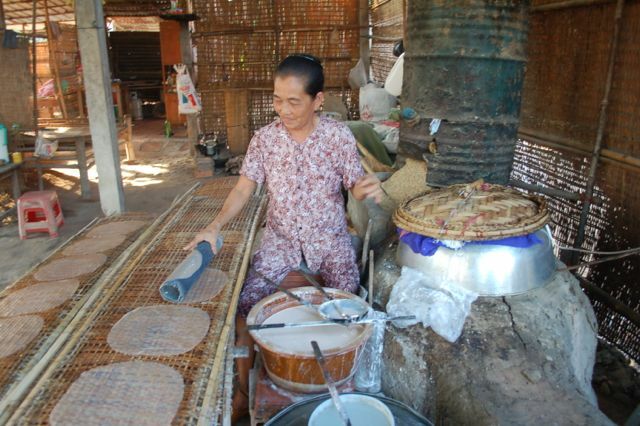 Slowing down the drying time keeps the rice paper from warping. As they finish drying, they unstick from the mats with a gentle popping sound, like slow rain on a quiet morning. 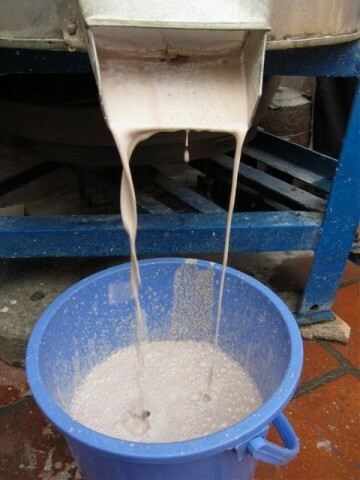 I’m getting the hang of spreading the rice paper thinly, but I forgot to stir the batter in the bowl and fill the ladle before I start lifting the wet round. Thanks, Di Yen! How many Tran family members does it take to help Thy unroll her first round of rice paper? 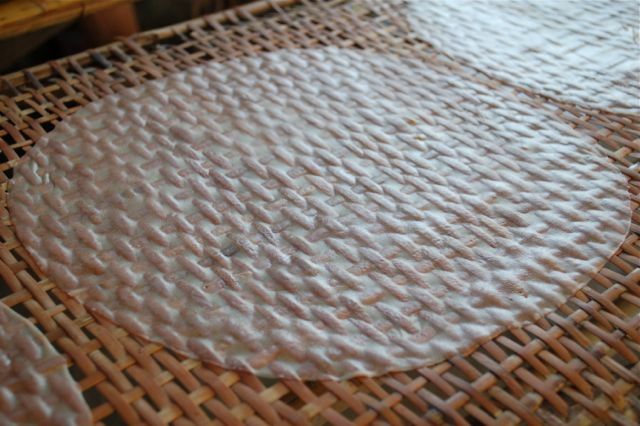 When spread a tiny bit thicker and eaten while still fresh, the rice paper rounds are called banh uot. This is a very popular breakfast dish. Di Yen drizzles scallion oil on the rounds I made (since they’re so conveniently thicker than usual), and we all enjoy their silken texture with a simple soy dipping sauce. 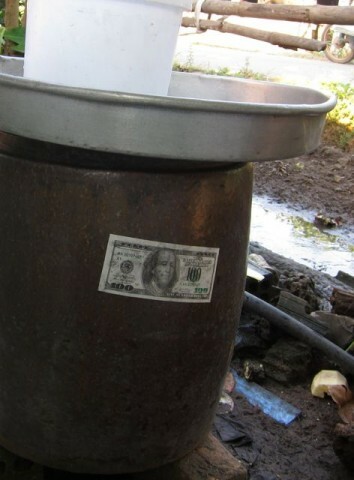 Hell money glued onto the water urn, in case the gods of prosperity and commerce are feeling a bit thirsty. 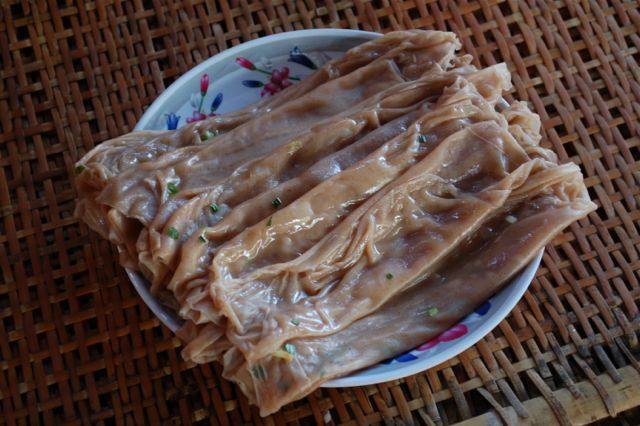 Now I know why Banh Trang has that pattern on it! Thanks Thy! I thought the same thing! It always looks like it was woven, but the woven pattern comes from the drying rack! This is fascinating! How lucky you were to get to make your own, whole grain even! It looks like it was delicous. Thy. This is beautiful. Thank you for sharing it. I will never, ever take a single wrapper for granted, even the machine made ones. 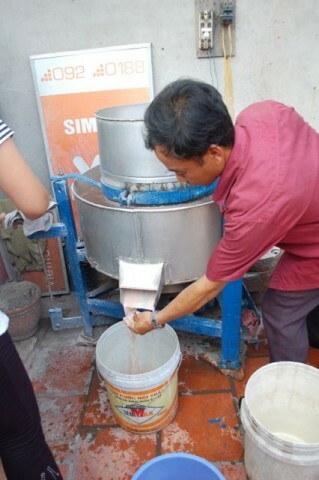 Hopefully one day I will try one made by the hand! This was written so well and explained so thoughtfully thank you! 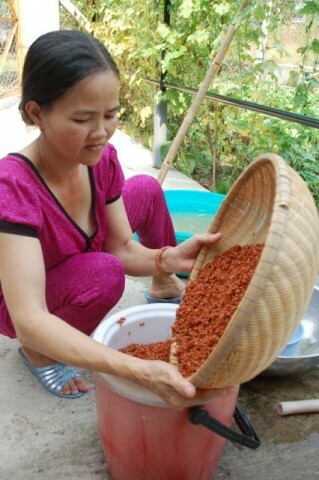 Do you by chance know how the drying process is done now? Do people still use the drying racks or is there a machine for that now? Thanks again for sharing and in such detail!